Looking for something different to do this spring with your Easter eggs? 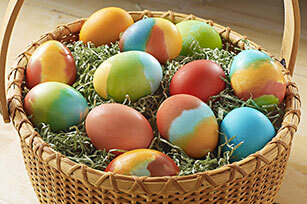 Here's a great idea on using KOOL-AID to color your eggs this year. I'm going to give it a try myself! Mix contents of 2 (same-flavored) KOOL-AID envelopes with 2 Tbsp. water in 6- to 8-oz. container; stir to dissolve drink mixes. Repeat in 3 separate containers with remaining KOOL-AID envelopes. Place eggs on cooling rack in sink; rinse eggs with tap water. by Erika Katz, the author of “Bonding Over Beauty,” Reprinted with permission. Enter to win a KOOL-AID Prize Pack! One lucky reader will win 20 envelopes of KOOL-AID to make Tie-Dye Easter Eggs. To enter, just fill in the Rafflecopter form below. You must be at least 18 years old and reside in the USA. Only the first entry is mandatory; bonus entries increase your chances to win. Giveaway ends at midnight ET on 3/31/2013. Good luck! I'm simple... I love some cherry! Cherry but my kids love grape! I'd have to go with Cherry. I love tropical punch. Thanks! I like the grape flavor! I have always loved Grape kool-aid! My favorite is Tropical Punch and I love adding some fruits to it to add more flavor. Great idea!! I will have to do this next year. I love Black Cherry!